The rapid advancement of Unmanned Aerial Vehicle (UAV) data in society and in programs at universities and even in some secondary schools has led to some amazing tools and data with which to analyze the world. Esri has a new UAV partner, the good people at Hangar, which operates a very innovative service to fly areas that people request them to. Hangar recently flew across Kilauea Hawaii and have compiled their 360-degree immersive UAV imagery into a story map. This makes for an incredibly engaging and rich tool for use in instruction, about human-environment interaction, impact of natural hazards, plate tectonics, current events, and much more. As an example, see the image I posted here: https://pbs.twimg.com/media/DgI567QVMAI1bbW.jpg or below. I highly encourage you to take a look at this story map, paying particular attention to the house being engulfed in photo # 11. But that's not all. Another recent advancement is the announcement of the new Sentinel-2 imagery in ArcGIS Online. Sentinel-2 is part of Copernicus, the world’s largest single Earth observation program directed by the European Commission in partnership with the European Space Agency. Esri makes the multi-spectral data quickly accessible using ArcGIS Image Server and publishes an image service through the ArcGIS Living Atlas of the World (Living Atlas), hosted on the Amazon Web Services Infrastructure. The service includes all Sentinel-2 imagery going back 14 months, enabling change to be easily reviewed, and is updated every 5 to 7 days. Incredible! Image analysis can be run directly on the service to create indexes displaying properties such as vegetation health or soil moisture as well as quantifying the changes over time, for better understanding of the environment. Below, I added the Sentinel-2 data from ArcGIS Online, zoomed to Kilauea, and rendered the image as Geology with DRA (Dynamic Range Adjustment) which makes use of the SWIR (ShortWave Infrared) bands 1 and 2 – along with blue in the third band. This only took a few minutes and now I can measure the length of the new lava from that day (in yellow), and make use of the Imagery with Labels or Open Street Map basemaps to determine the homes that are affected. My students could investigate further to determine exactly which of the homes are shown in the UAV images in the above story map. For more information, see my video on the Hangar Esri UAV story map and my video on the Sentinel-2 data. Update: A new video showing blue flame from methane in this exact rift zone is very compelling and makes for an excellent supplement for the above two resources that I described. The video is here: Hawaii volcano: blue flames burn in streets as methane escapes - YouTube . Sentinel-2 imagery rendered as Geology with DRA and filtered for 23 May 2018 in ArcGIS Online. This year, we will be streaming the world's largest GIS gathering, the UC Plenary live on Facebook. This will be an incredible way for you to tap into the energy and atmosphere of this international event of 18,000 even if you cannot be physically at the San Diego Convention Center during the event. The plenary will take place on Monday 9 July 2018 from 8:30am to 3:30pm Pacific Daylight Time. This all-day Plenary Session starts off with Esri’s vision, software roadmap, demos of winning workflows, transformation stories from peers, and inspirational keynotes. If you’re unable to attend Esri UC in person, click the “Going” button on the Facebook link to receive updates and be a part of it. Check out the plenary agenda starting here: https://userconference2018.schedule.esri.com/schedule/438070734 and follow us here: https://www.facebook.com/esrigis/. If you can attend in person, we have thousands of hours of workshops, sessions, and demos lined up to help you improve your skills and stay on top of evolving technology. More than 300 exhibitors will share the latest software, hardware, and solutions. Register Here: Registration Rates and Details. Ever since Rajinder Naji, Dr Dawn Wright, and my other Esri colleagues announced that elevation services were in ArcGIS Online, I have been wanting to use them in Pro not just for visualization, but analysis. More than elevation services are now available--land cover, for example, is another. I recently began using these services and am quite pleased with the results. I am using them in some lessons I have written where students analyze wildfires in grasslands, the optimal site for cell phone towers, and suitable lands for specific types of agriculture. Moreover, I believe this advancement represents an excellent example of the paradigm shift that GIS is in the midst of, namely, from desktop to cloud, including Software-as-a-Service (SaaS) and Data-as-a-Service. No longer do you need to follow the standard workflow of the past two decades, where you download data that you need to your local device where you then perform the analysis. You can access the services online and use them inside ArcGIS Pro. Advantages are many: You do not have to spend your valuable time searching for, downloading, clipping, and reprojecting pieces of data, which took many steps as shown in our exercises associated with the Esri Press GIS Guide to Public Domain Data book. Furthermore, you do not have to store large data sets on your local device. Rather, you can stream the data in for your desired study area and thus have more time for investigating, analyzing, concluding, and publishing your results. Elevation data supports numerous GIS applications ranging from deriving slope and aspect, stream delineation, cut and fill analysis, viewshed analysis, orthorectification of aerial photography or satellite imagery, rendering 3D visualizations, creating relief maps, and for various types of analysis and visualizations. The elevation and land cover services are available for use within the ArcGIS Online platform, and are part of the Living Atlas. You can access the entire collection of layers along with geo-processing tools from within the Elevation Layers Group on ArcGIS Online. Access to these global layers is free and does not consume any credits; all you need is an ArcGIS Organizational account. The "old paradigm" of downloading and using data locally still has its place, and it will be around for some time to come. But that's not the only option these days. Moreover, I suspect that more raster data sets will be added in the future to the Living Atlas, and as it is added, the streaming method will become even more attractive in the future. If you want to simply visualize elevation, slope, aspect, and land cover, for example, use Add Data > Portal > Living Atlas > search for these layers and add them to your map view in ArcGIS Pro. To do analysis on land cover, elevation, slope, or aspect, you need to select such items as “terrain: slope in degrees” – and “aspect” – not the map, but the service. Also important is to use Environments in the raster calculator (or any other geoprocessing tool that you are using) to set the analysis extent to your display, a watershed, or some other specific area so you’re not analyzing the whole country or the whole world!. See screens below (my study area is the wonderful terrain in western Colorado). The results of my raster calculator on streaming terrain--the thin yellow areas are where the slopes are greater than 50 degrees. Results after Raster Calculator analysis was applied to the streaming NLCD Land Cover data, with shrub/scrub land cover shown in yellow. Searching for Terrain Slope in Degrees and Terrain Aspect (direction of slope) from the Living Atlas, using the Add Data tool in ArcGIS Pro. For more details, see my video on this topic. Enjoy the new paradigm! Please share your reactions in the comments below. I have used The Internet Archive (https://archive.org/about/) for many things over the years, from archiving multimedia that I created for my story maps to looking up information on historical web pages through their Wayback Machine, (as well as listening to some old wonderful sound recordings) and through those efforts became aware of the wealth of information on the site. And when I say wealth, I truly mean enormous - 279 billion web pages, 11 million books and texts, 4 million audio recordings (including 160,000 live concerts), 3 million videos (including 1 million Television News programs), 1 million images, and100,000 software programs. But did you know that The Internet Archive also houses some geospatial data? The Internet Archive, a 501(c)(3) non-profit organization that has existed since 1996, states that its mission is to "provide Universal Access to All Knowledge," so it makes sense that some geospatial data for the public good is there. Let's focus here on the USGS topographic map data on The Internet Archive, also known as Digital Raster Graphics (DRGs). Start here for a list of these maps by state, and then underneath each state, a variety of search options are available. It isn't the most intuitive unless you know the specific map name that you are looking for, so a topographic map index may still come in handy; a scanned version of these is not easy to come by, but one such archive is here. Formats include GeoTIFF, essential for use in a GIS. Interface on The Internet Archive for USGS Digital Raster Graphics. While I still find the interface on the other main DRG archive, LibreMap, to be a bit easier to use, LibreMap is not maintained any longer, and is starting to return some errors during certain searches. The Esri USGS Historical Map Explorer, and the USGS TopoView, which I reviewed here, is more modern approach to obtaining topographic maps, with the added benefit of historical editions. USGS topographic maps are part of the set of basemaps available inside ArcGIS Online as data services, which is increasingly part of modern GIS workflows, rather than downloading the data and using it locally. Still another archive is that from Historical Aerials, which I reviewed here. 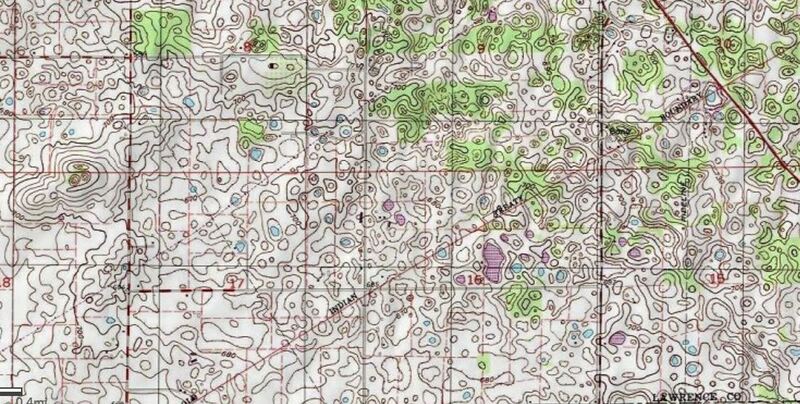 A section of my all-time favorite USGS topographic map, for Mitchell Indiana, simply because of the intricacies of the depression contours and disappearing streams in this magnificent karst landscape. Join us for a MOOC MeetUp at the Esri User Conference! Past and future MOOC students attending the Esri User Conference in San Diego are invited to our very first MOOC MeetUp on Tuesday July 10 from 11:30 AM - 12:30 PM in the convention center room 25 A. Please come by! No RSVP needed!